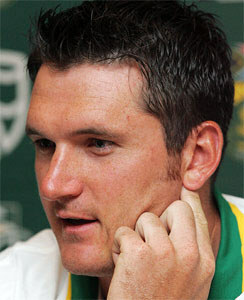 Perth, Dec. 17 : In an explosive claim leading into the first South Africa-Australia Test at the WACA Ground in Perth, South African captain Graeme Smith says Warne has told him how he should go about bringing down Australia''s batting champions Ricky Ponting and Matthew Hayden. Writing an exclusive column in The Daily Telegraph, Smith reveals he used his stint at the Rajasthan Royals under Warne''s captaincy to gain inside information on Australia''s batsmen. "I was asking him about Matthew Hayden and Ricky Ponting and he told me how he would try to get them out if he was captain,'''' Smith writes. Warne last night laughed off suggestions he had turned informant and given Smith valuable hints on Australia''s senior batsmen. "We discussed playing against Australia and how South Africa has lacked a bit of flair, losing the big moments in matches against the Aussies,'''' he said.